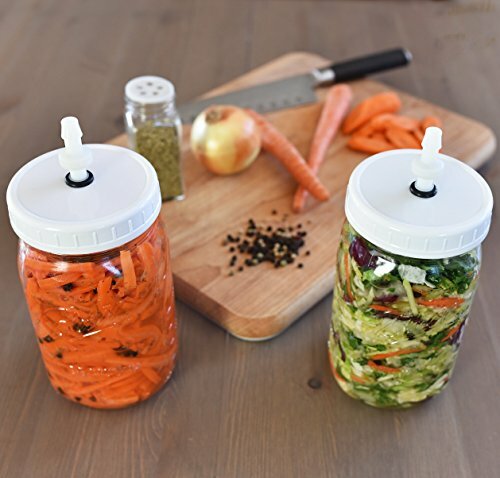 Pickle and Ferment Your Favorite Vegetables, Fruits, & More! Our compact, waterless airlocks make fermenting as set-it and forget-it as you can get. Pack your veg & fruits into your crock, pour your brine in, put the seal on, place your cap on, ferment, and move right in to the fridge. Our airlocks will keep your food fresh while in the fridge, no need to replace the cap! Lacto-fermentation not only provides many health benefits, but is a delicious way to prepare many favorite foods. Make Sauerkraut, Kimchi, Kombucha Tea, and so much more, right at home! Use with our Made in the USA FermentEm Cabbage Tamper & FermentEm Glass Fermentation Weights to get the most out of your ferments. While every one else is content offering you the same clunky fermentation kit, with the same exact pieces, we’re not. We want to make fermenting better-for YOU. Everything is sourced/made in the USA to ensure only the highest quality. We manufacture in the heart of the Midwest! No water to pour, no water to monitor, no pieces to clean (just one). A lower profile means you can fit everything in the cupboard, on the cabinet, or in the fridge, more easily. Move your fermenting jar right into the fridge! 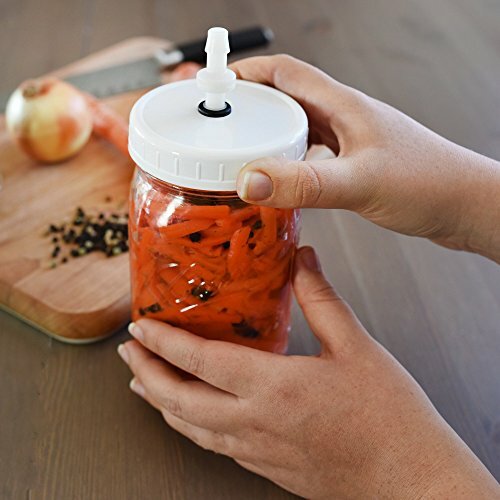 Our waterless fermentation airlock will keep the air out & keep your food fresh. No messing with metal caps or bands or clunky domed caps. Move right into the fridge w/out removing or adding anything! The FermentEm(tm) 8-Piece Kit is perfect for the beginner looking to start, as well as the more experienced fermenter. Our re-usable plastic lids will fit any wide mouth mason jar. 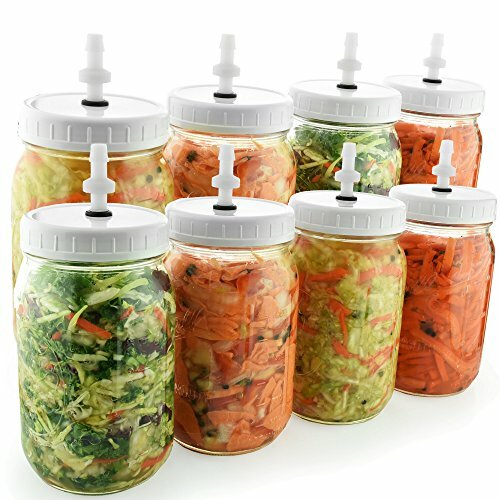 The silicone seals provide an airtight seal for the fermentation lids without the need for heat like with metal mason jar lids, and with proper care and maintenance can be used many times over. The 3/8″ grommets are the perfect size for allowing the airlock to fit perfectly without letting any air out or in. Please clean before use. 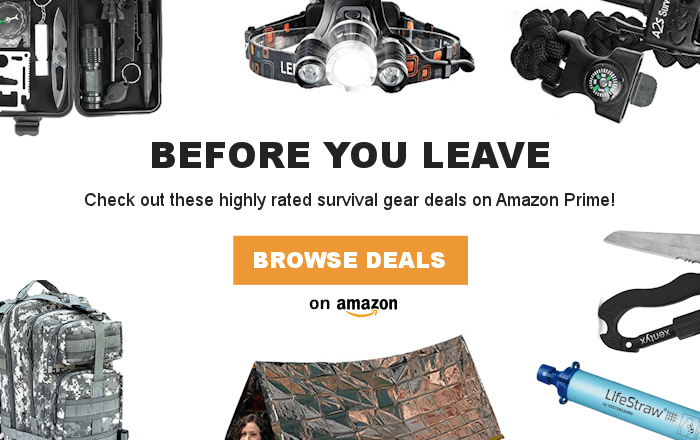 We hope you enjoy using this kit as much as we do!